فهیمی, حسین, سیاه‌کوهی, حمیدرضا. (1391). بهبود نتایج روش شکست مرزی هم‌میان نقطه با استفاده از روش GRM. 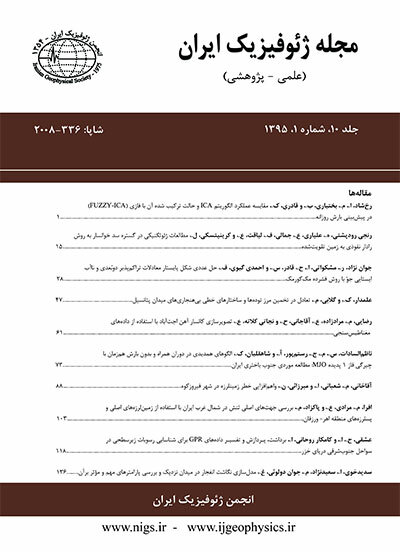 مجله ژئوفیزیک ایران, 6(2), 124-140. حسین فهیمی; حمیدرضا سیاه‌کوهی. "بهبود نتایج روش شکست مرزی هم‌میان نقطه با استفاده از روش GRM". مجله ژئوفیزیک ایران, 6, 2, 1391, 124-140. فهیمی, حسین, سیاه‌کوهی, حمیدرضا. (1391). 'بهبود نتایج روش شکست مرزی هم‌میان نقطه با استفاده از روش GRM', مجله ژئوفیزیک ایران, 6(2), pp. 124-140. فهیمی, حسین, سیاه‌کوهی, حمیدرضا. بهبود نتایج روش شکست مرزی هم‌میان نقطه با استفاده از روش GRM. مجله ژئوفیزیک ایران, 1391; 6(2): 124-140. در روش CMP-refraction (CMPR) که بیشتر به‌منظور بهبود نسبت سیگنال به نوفه امواج شکست مرزی معرفی شده است، ساختار لایه‌های کم‌عمق زمین با استفاده از اطلاعات دامنه، بسامد و خصوصیات فازی قطار موجی که به‌دنبال اولین شکست می‌آیند، توصیف می‌شود. با این روش نحوه لایه‌بندی، وجود گسل، نواحی سست و شکاف‌ها در اعماق کم قابل شناسایی هستند. در این مقاله سعی بر آن است تا با استفاده از پارامترهای به‌دست آمده از روش GRM، نتایج روش CMPR را بهبود دهیم. مقایسه مبانی نظری دو روش رابطه‌ای نزدیک بین این دو روش، از لحاظ سینماتیک انتشار موج نشان می‌دهد. سرعت‌ها و دوراُفت‌‌‌های بهینه تعیین شده به روش GRM را می‌توان به طور مستقیم در تبدیل رادون جزئی مورد استفاده در روش CMPR ، به‌کار گرفت. در این مقاله ضمن بیان شیوه ترکیب دو روش، با مطرح ساختن کاربردهایی از آن روی داده‌های لرزه‌ای مصنوعی، میزان بهبود نتایج نشان داده می‌شود. همچنین نشان داده می‌شود که مقطع زمان برخوردگاه به‌دست آمده با استفاده از روش‌های مهاجرت مرسوم در لرزه‌نگاری بازتابی، قابل تبدیل به مقطع عمقی است. A useful method to increase the signal/noise ratio of refracted waves is Common-Midpoint Refraction (CMPR) seismics. Consider a plane wave traveling from the source location A to a receiver point B (or vice versa). The distance between the two locations A and B is denoted as x. If the reference point is the CMP between A and B the relation is valid and one can write its travel time equation based on the ray parameters and vertical slowness (Diebold and Stoffa, 1981). For such a model, Slotnick (1936) obtained an equation which is the basic equation for depth conversion in CMPR method. With this technique, the shallow underground can be described in detail using all information (amplitude, frequency, phase characteristics) of the wavetrain following the first break (first-break phase). Thus, the layering can be determined and faults, weak zones, and clefts can be identified. This will be done by stacking a trace in a domain. Since the stacking data along the straight line of the Radon transformation is used to suppress reflected wave groups and surface waves in CMPR method, the Radon transformation must be restricted to refracted waves only. After Radon transformation, an intercept-time section is made. The following difficulties occur when dealing with CMPR seismics. 1. The data will be sorted as CMP-offset gathers. Therefore, the distance between two traces is twice the distance between two shot points. Thus, optimum stacking velocities for the partial Radon transformation in CMPR seismics cannot be determined. 2. Local variations in refractor velocities are difficult to record. 3. In routine CMPR seismics, the traveltime branch of the total refracted signal is stacked. Therefore, local irregularities of interest cannot be detected. These disadvantages are rectified using a combination of CMPR seismics with the Generalized Reciprocal Method (GRM; Palmer, 1986). This joint application is possible because of the close relationship between both methods in their kinematical descriptions. Gebrande (1986) described a technique to construct CMP traveltime curves using the data from only one forward and one reverse shot. Using this technique, the CMP intercept time would be in the form of an equation which have some similarities in comparison to in GRM. These similarities and their relationships are helpful in rectifying certain disadvantages in the CMPR method. Velocities and optimum offsets determined by the GRM can be used directly in the partial Radon transformation in CMPR. The result of this process is an intercept-time section which can be converted directly to a depth section. In the partial Radon transformation of joint CMPR seismics with the GRM, the stacked events are only those that belong to the critical offset in the CMP-offset gather. These events are principally the critical reflected waves. Therefore, the migration of the intercept-time section must employ a post-stack method such as Kirchhoff migration. After migrating time section it can be converted to depth section using its individual equation. Using two models for numerical investigation, the efficiency of the method is tested, and the results are shown. Benjumea, B., Teixido, T., and Pena, J. A., 2001, Application of the CMP refraction method to an archaeological study (Los Millares, Almeria, Spain): J. Appl. Geophys., 46, 77-84. Diebold, J. B., and Stoffa, P. L., 1981, The traveltime equation, tau-p mapping, and inversion of Common-Midpoint data: Geophysics, 46, 238–254. Edge, A. G. and Laby, T. H., 1931, The Principles and Practice of Geophysical Prospecting: Cambridge University Press, London, 339-340. Ewing, M., Woollard, G. P., and Vine, A. C., 1939, Geophysical investigations in the emerged and submerged Atlantic Coastal Plain, Part 3, Barnegat Bay, New Jersey section: GSA Bull., 50, 257-296. Gardner, L. W., 1939, An areal plan of mapping subsurface structure by refraction shooting: Geophysics, 4, 247-259. Gebrande, H., 1986, CMP-Refraktionsseismik, Dresen, L., Fertig, J., Ru¨ter, H., Budach, W.(Eds. ): Seismik auf neuen Wegen, 6th Mintrop-Seminar, Unikontakt, Ruhr-Universit¨at Bochum, 191–206. Hagiwara, T., and Omote, S., 1939, Land creep at Mt Tyausu-Yama (Determination of slip plane by seismic prospecting): Tokyo Univ. Earthquake Res. Inst. Bull. 17, 118-137. Hales, F. W., 1958, An accurate graphical method for interpreting seismic refraction lines: Geophysical Prospecting, 6, 285-294. Hatherly, P. J., 1990, Comments on Engineering Geophysics – A Geophysicist’s View by R. J. Whiteley, Exploration Geophysics, 21, 139–142. Hawkins, L. V., 1961, The Reciprocal method of routine shallow seismic refraction investigations: Geophysics, 26, 806–819. Leung T. M., 1995, Examination of the optimum XY value by ray tracing: Geophysics, 40, 1151–1156. Leung, T. M., 2003, Controls of traveltime data and problems with the generalized reciprocal method: Geophysics, 68, 1626–1632. Palmer, D., 1980, The generalized reciprocal method of seismic refraction interpretation: SEG: Tulsa, 104. Reimers, L., Ruter, H., Unterstell, B., 1991, CMP-Refraktionsseismik mit Wellen-gruppenstapelung im -Bereich In Dresen, L., Fertig, J., Ru¨ter, H., Budach, W. (Eds. ): Geophysik zwischen Exploration und Exploitation, 11. Mintrop-Seminar, Unikontakt, Ruhr-Universit at Bochum, 101–128. Sjogren, B., 2000, A brief study of the generalized reciprocal method and some limitations of the method: Geophysical Prospecting, 48, 815–834. Slotnick, M. M., 1936, On seismic computations with applications: Geophysics, 1, 1- 22. Thornburgh, H. R., 1930, Wavefront diagrams in seismic interpretation: AAPG Bull., 14, 185-200. Whiteley, R. J., 1990a, Engineering geophysics - a geophysicist’s view: Exploration Geophysics, 21, 7–16. Whiteley, R. J., 1990b, Discussion: Exploration Geophysics, 21, 131–138. Whiteley, R. J., 2002, Shallow refraction interpretation in complex conditions with visual interactive ray tracing: 64th EAGE Conference & Exhibition, 155.